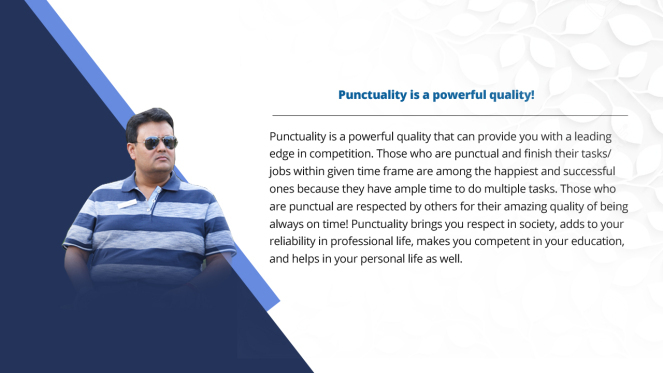 Punctuality is just a good habit that you need to develop! I think, punctuality is a habit that can be developed with a strong will and determination. Rather than blaming it on your DNA, look at your own nature of procrastinating things! No one is born punctual! We all have to work hard to develop good habits and punctuality is just one of these very good habits. I find it strange when people say that they have inherited lethargy and tardiness, hence, nothing can be done to fix it. Remember, it all comes from our own heads. If you really want to become punctual, all you need to do is make small habit changes and become determined to achieve the goal. When someone calls you or invites you to some place, make sure you stick to the time and be there right on time. For reaching somewhere on time, you will have to leave on time because there are many reasons, such as traffic on the way, and other reasons, which may make you late for your destination!